Here is a quick run through on Team Knowledge’s TK Dialogs product and a comparison between TK Dialogs and the out-of-the-box Microsoft CRM 2011 Dialog feature. Microsoft CRM 2011 ships with a Dialog feature at no additional cost, TK Dialogs is a 3rd party ISV product / add-on for Microsoft CRM that you need to pay for. 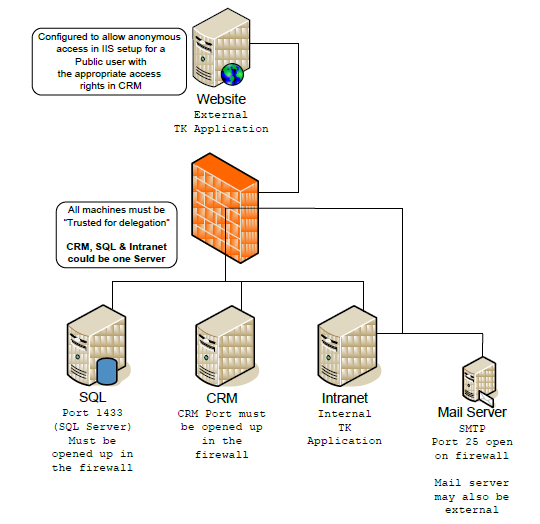 The out-of-the-box (OOTB) Dialog feature is installed with and is part of the CRM server application. It is not installed separately, it is not identifiable as a separate component. As I compare the 2 products and look for something that the OOTB Dialog feature has which TK Dialogs is missing I find nothing significant jumping out at me. The advantage of the OOTB Dialog feature is it is free, it is 100% integrated and it is not 3rd party. So this product comparison really boils down to what additional functionality do you get for your money with TK Dialogs. The ability to move components is a feature I miss in the OOTB Dialog designer in Microsoft CRM, it is not uncommon to find yourself having to delete components and recreate them at another level. The flow chart view is nice in TK Dialogs but I’ve always been happy enough with the indented tree view approach that Microsoft’s took with their OOTB Dialog designer. 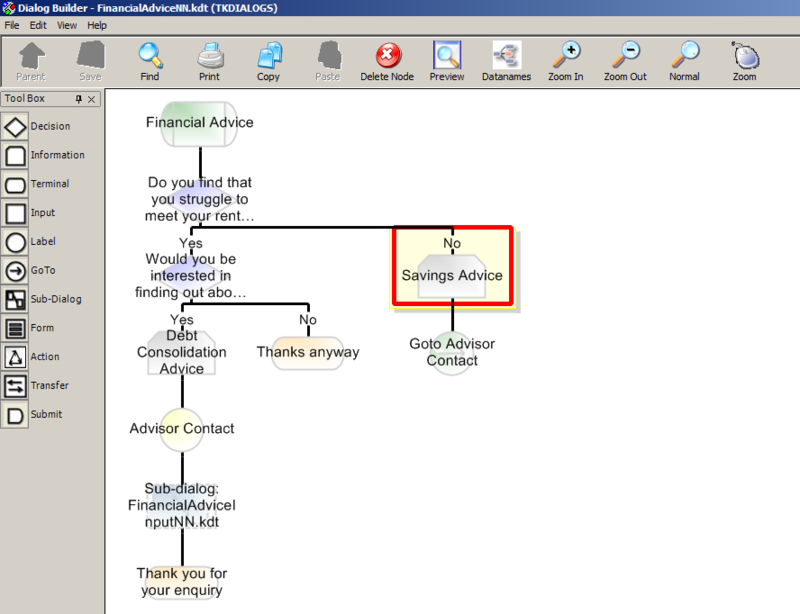 The flow chart look and feel would certainly demo better. Within your TK Dialogs you can generate a Word or PDF document and then attach the document to a CRM record or attach it to an email and send. Email Recipient can Resume Dialog – Both the OOTB Dialog feature and TK Dialogs can send emails. Those emails can contain links to CRM records to direct the email recipient into CRM to take some action – e.g. to approve a transaction. An advantage TK Dialogs has is it can include a link in the email that directs the user into an in-progress Dialog. This keeps them out of CRM and directs them to the exact action required of them, rather than just to a CRM form. This opens up some interesting possibilities around licensing and user experience. Think of a scenario where you have a large number of users who need to either initiate requests and/or provide responses / approvals at certain stages of business processes. If these users don’t require full CRM functionality then you could potentially save yourself some licensing costs and have these users use TK Dialogs instead of Microsoft CRM. The would initiate requests through TK Dialogs and when their input/approval is required they could be sent an email with a Resume Dialog link that would take would pop the relevant Dialog prompting them for the information/decision required. Once their input is provided the Dialog could send focus back to the back office worker to complete the business process. Upload Files – TK Dialogs take the Prompt and Response capabilities one step further allowing the response to be a file which the user browses for on their desktop and then uploads into the Dialog process. The Dialog can then store, email or attach the document to a CRM record. Redirect to/from External Apps – TK Dialogs can be integrated with external applications such that part way through a Dialog process the user can redirected to an external web application and then upon completing some steps there get redirected back to the Dialog. Variables can be passed between the applications to default values and provide responses. This form of integration is useful for online credit card payments. Save and Resume – This feature is noticeably absent from the OOTB Dialog feature in Microsoft CRM. I guess because the OOTB feature is aimed at internal users it is a less of requirement then in those scenarios where you have internal or external customers completing self service dialogs for the likes of visa applications. The feature works well in TK Dialogs, the user requests to Save and is provided with a URL and pin so they can resume at a later time. When would I propose TK Dialogs? Please share your experiences with TK Dialogs and any key features you have found valuable. 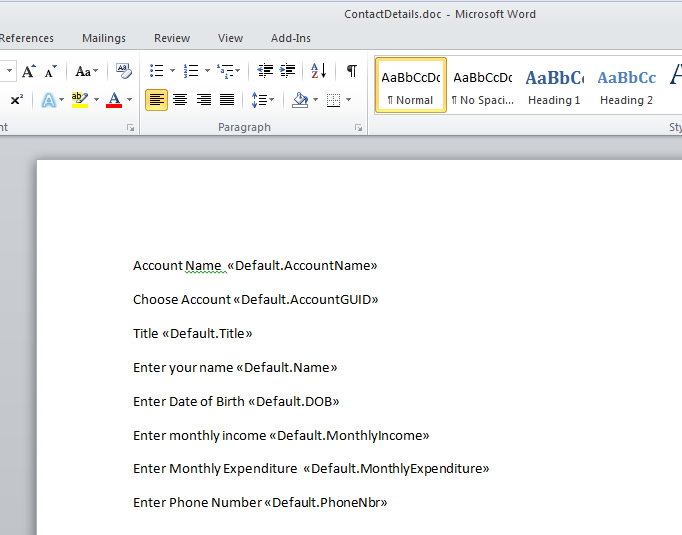 This entry was posted in Uncategorized and tagged CRM 2011, Dialogs, TK Dialogs on July 11, 2012 by Gareth Tucker. If your Dialog has branching logic make sure you don’t use the Responses from those branches in any later actions after the branching as those Response values will not be available in those scenarios when the user branches the other way, and CRM doesn’t like that. To get around this make use of Variables within your Dialog. Initialise a Variable at the start of your Dialog, update it within your branch and then you can happily refer to the Variable later in the script. Beware of placing actions such as creating records and sending emails in amongst Pages of your Dialog, they’re better placed at the end of your script firing only after the user has clicked Finish in the Dialog. Reason for this is the Dialog UI happily allows users to navigate backwards and forwards within the Dialog. If you have a record creating firing between pages 4 and 5 of your script that record creation will happen not only the first time the user progresses to page 5 but if they hit previous, go back to page 4 and then progress on to page 5 again then yeap you guessed it you will get another record created. 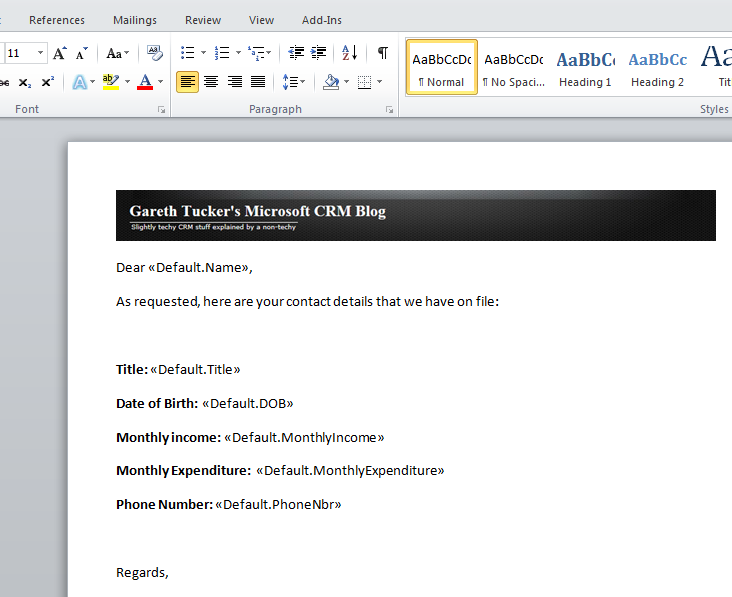 This entry was posted in Uncategorized and tagged 2011, crm, Dialogs on June 16, 2011 by Gareth Tucker.